6 Success Blocking Habits You Need To Stop Doing - Motivate Amaze Be GREAT: The Motivation and Inspiration for Self-Improvement you need! Success it's not only about new things you can add to your life, sometimes it's a matter of things you should stop doing. 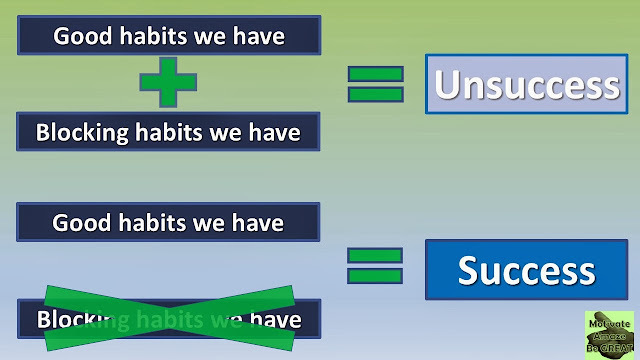 We already have the things that are really necessary to achieve our goals (good habits), the problem here is that we may also have unnecessary things (blocking habits) that are in direct contradiction with the good ones. Stop doing the blocking habits because they really stop your chances of succeed in whatever area you want to be successful. You can’t do everything by yourself. Learn to delegate some tasks, even those thins you actually like to do, to others. Team work it's essential to succeed. You can’t be a “control freak”, obsessed to do everything by yourself. This will destroy others necessity of being, let people be bright in their own way, give them your light so they can shine also, everyone needs to feel that they are capable and needed. That’s right! Your mind can trick you in a number of ways. You cannot trust it all the time. Don’t make decisions merely based on your mind, it is when things get to your guts that you’ll make the better decisions. Mind it’s a matter of way of thinking, guts it’s a matter of real inner necessity or not. If you are a very negative person you’ll make very poor decisions that aren't good for you. But if you feel it in your guts that’s were all the energy for real choices is. The time we spend on crying about how things went wrong, the time we spend whining and mumbling about how things are unfair, it’s a waste of time. So stop with it! These are very negative common places, what you need to do it’s to get back to a productive state! As long as you keep thinking negative you’ll get negative outcomes. It’s a must that you get on with your life, work, relationship, whatever the case may be, and stop with the childish stubbornness. Learn to accept a mistake and move forward. You can’t be always right, sometimes you will fail. But that’s ok! As long as you learn from that mistake. One key thing is that you acknowledge too yourself and your peers that was your mistake, that’s the first major step in order to correct the mistake, you'll become more alert and perform better next time a similar situation or task occurs. Remember when we were kids, when something went wrong we would graciously point out our friend as the guilty one, even though we were the ones who made the mistake? That was the blame game. Ahah, it was funny back then, now it’s not! Every mistake you make and you don’t take fully responsibility for it, it’s one step backwards in your way to achieving your goals. Stop finding people to blame, and realize you are the major contributor to your life. We all have blocking habits don't get discouraged, do the best you can to stop doing them. It's important that you keep in your mind that this is a progressive process, concentrate in one habit at a time and deal with. Losing and gaining habits it's a matter of time and dedication. That's really good because success it's not a overnight thing so it matches the time you need to lose those blocking habits, be patient.